Before we can attempt to connect current events and entities with Bible prophecy, we must ensure that we have a good grasp of the prophecies. In this article we will focus on three particular entities in Bible prophecy, and speculate on the identities of each. Be careful to understand that not every beast in scripture denotes the same entity, such that great care should be taken in connecting a beast from one context into that of another. Take note as well that where there is a kingdom, there must be a king, though a kingdom can span many kings in succession. Also, when the angel tells the apostle John that someone "was, is, will be", it is referenced from John’s time, which was the late first century A.D. The seven heads are seven hills on which the woman sits. They are also seven kings. Five have fallen, one is, the other has not yet come; but when he does come, he must remain for only a little while. The beast who once was, and now is not, is an eighth king. He belongs to the seven and is going to his destruction. The ten horns you saw are ten kings who have not yet received a kingdom, but who for one hour will receive authority as kings along with the beast. They have one purpose and will give their power and authority to the beast. They will wage war against the Lamb, but the Lamb will triumph over them because he is Lord of lords and King of kings— and with him will be his called, chosen and faithful followers. Focusing on the Beast and not the woman, we see that it existed before John’s day, did not exist in his day, and would exist once again after his day, though no indication is given as to the length of time. It has 7 heads which are a line of 7 kings, 5 of whom had fallen before then. The 6th was alive in his day, and the 7th was to come later but only reign for a short time. Connected with the 7 but distinguished from them is the 8th and final king, who is equated with the Beast itself. However, this is a king rather than the Beast system, since "he" rather than "it" will "go to his destruction". Here is the point of confusion: the Beast, whose heads symbolize a line of 7 kings, did not exist in John’s day, yet the 6th king did exist in his day. But remember that the kings map only to the heads, not to the whole Beast. So in John’s day, there was a head (6th king), but not the Beast. The 7th king will reign for a short time, but the 8th king is the Beast rather than one of the heads. How can this be resolved? One possible answer is that the Beast is literally a king rather than a kingdom. Yet how can a king have existed from ancient times, not existed in John’s day, and exist again in the future? Is this the anti- "king of kings", Satan incarnate? But why was he not in power in John’s day? Could it be what Jesus meant when he said that "now the prince of this world will be driven out" (John 12:31)? Yet in Rev. 2:13 Jesus tells the church at Pergamum that they lived "where Satan has his throne", so since the Beast "was not" in John’s day, this must be ruled out. Another possible answer is that this phrase is not to be taken as in reference to the time of John, but to the fact that the Beast appears, is killed, and then rises again; see Bible Study Tools. This would solve the dilemma over timing and fits naturally with the delusion or misdirection sent from God to make the world believe this proves the Beast to be Jesus instead. This would also mean that the Beast is the evil power behind the five kings/kingdoms prior to the first century and the one who was present during his time. That is, the line of kings is not characterized by nationality but by Satanic power. Now we focus on the woman riding the Beast. She is not the Beast itself but is using it and depending upon it. And for the Beast to carry her, she must have something it needs. Then the angel carried me away in the Spirit into a wilderness. There I saw a woman sitting on a scarlet beast that was covered with blasphemous names and had seven heads and ten horns. The woman was dressed in purple and scarlet, and was glittering with gold, precious stones and pearls. She held a golden cup in her hand, filled with abominable things and the filth of her adulteries. The name written on her forehead was a mystery: Babylon the Great, the Mother of Prostitutes and of the Abominations of the Earth. I saw that the woman was drunk with the blood of God’s holy people, the blood of those who bore testimony to Jesus. When I saw her, I was greatly astonished. Then the angel said to me: “Why are you astonished? I will explain to you the mystery of the woman and of the beast she rides, which has the seven heads and ten horns." She sits by (or on) many waters, which symbolize "peoples, multitudes, nations and languages"
She is "the great city that rules over the kings of the earth"
Remembering that the woman is neither the Beast nor any of the kings, but rather has been using and depending upon it/them, we can rule out her being a government. Yet she has been associated with the Beast and its kings, apparently for a long time, since the Beast has come to loathe and resent her. When her usefulness to the Beast has expired, it turns on her and utterly destroys her. Since the angel is telling John what the woman symbolizes, we cannot take these characteristics as more symbolism. She has deceived the entire world through its rulers, she is in a desolate location, she is "queen of the world", she is charged with all the debauchery and spiritual rebellion of the world, she is guilty of the blood of followers of Jesus and all God’s holy people, and she is a city with authority over all the world’s rulers. Many who try to identify her seem to overlook the very clear characteristic of her being a city. But in the further discussion of her demise in the next chapter in Revelation, we see additional details about this city: a demon-infested place of great wealth and the hub of world-wide commerce, which includes not only luxuries but also human trafficking. Calling herself a queen matches Isaiah 47 almost exactly, adding that God mocks her by daring her to rely one last time on her sorceries and incantations, which of course means that she is steeped in the occult and the dark arts. That passage also calls her "virgin daughter of Babylon", which is an important tie to the ancient Babylonian religion. Though there are several possible candidates in the world today that might fit many of these characteristics, we must insist that the real candidate fill them all completely. Thus, we can rule out particular nations or ethnic groups, and her religious aspects must also match a literal city. But she is called Babylon for a reason, so we would expect her to use symbols, colors, and names associated with ancient Babylonian religion, even if the city is not literally ancient Babylon. According to Harry Ironside in Babylonian Religion, the destruction of Babylon forced the religious practitioners to flee, and they first went to Pergamos (Pergamum)— exactly where Jesus said the throne of Satan was in the first century. From there they moved on to Italy and settled in Rome. Not the least bit coincidentally, this Roman headquarters used the symbols of Dagon, the fish god, and its priests wore fish-head mitres and "the fisherman’s ring". So this entity is a city which is the seat of Babylonian religion, has spilled the most blood of followers of Jesus, is the hub of world commerce and human trafficking, and is the seductive power controlling all the world’s governments. But she is not the Beast, or "the son of perdition", or Satan himself. There is more than one Beast in Revelation, but the second one is more commonly known as the False Prophet; Revelation uses both names to describe this person. This one is not part of the Beast itself or its heads, but is the highest-ranking person below the Beast. He is in charge of worship of the first Beast and is the one who actually orders "the mark of the Beast". At that point (the midpoint of Daniel’s 70th Week), the Beast has dispensed with the harlot and now demands all the world’s worship as God. We are shown two beasts in Rev. 13: one out of the sea (presumably the first Beast discussed earlier), and one out of the land. It is this passage which speaks of the first Beast being given Satanic authority and power, and that one of its heads (a king, not one person’s literal head) had received a mortal wound that was healed, which is why the whole world worships the dragon who gave the Beast its power. That is, this "head wound" is an individual king who was apparently ("it looked as if...") killed and then raised to life again. This act is what fools the world into thinking the Beast must truly be God, by seemingly raising the dead. We have seen three major personages in prophecy yet to come: the Beast, the Harlot riding the Beast, and the False Prophet. Can we possibly tie them to entities or events in today’s world? We certainly can, in many respects, but many uncertainties still remain. Prophecy passages not covered here give more details, with a particularly significant one in Ezekiel 38-39. This is where we read about Gog of Magog and its desire to plunder "a nation recovered from war, living securely, a people gathered from many nations to the mountains of Israel, which had long been desolate." The plunderers come "from the far north, you and many nations with you, all riding horses." But God Himself destroys this vast army with an earthquake, plague, torrential rain, hailstones, and burning sulfur. Daniel 11 speaks of "the king of the north", but this may have been at least partially fulfilled in the past, as some details bear strong resemblance to historical events. Yet vs. 40 says, "At the time of the end the king of the south will engage him in battle." Many see a break between vss. 35 and 36, since vs. 35 has the phrase "until the time of the end", so it could well mean that vs. 36-45 are yet future. And Revelation 16 speaks of "the kings of the east" coming to battle at the 6th Bowl judgment. So we have kings of the north, south, and east— but what of the west? Does this omission imply that the Beast’s kingdom will arise from the western world? 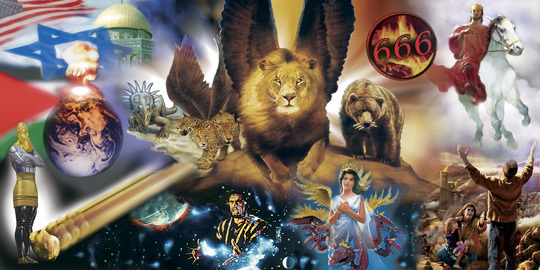 Daniel’s prophecy of 70 Weeks implies that "prince that shall come" is the first Beast of Revelation, and given the scope of war and battle from the other three directions, it would seem that the only place left for the kingdom of the Beast is the west. Keep in mind also that though the harlot is associated with Babylon’s religion and a powerful city, the Beast will hate her and destroy her. So it seems fairly certain that the west is not Babylon, but it may well be the Beast.